The Brunswick High School girls' basketball team huddles on the sideline after the first quarter of its quarterfinal round matchup against rival Mt. Ararat High School Monday in Portland. Brunswick High School’s Charlotte MacMillan scored 19 first-half points as the Dragons built an insurmountable early lead and coasted to victory over rival Mt. Ararat High School, of Topsham, Monday. 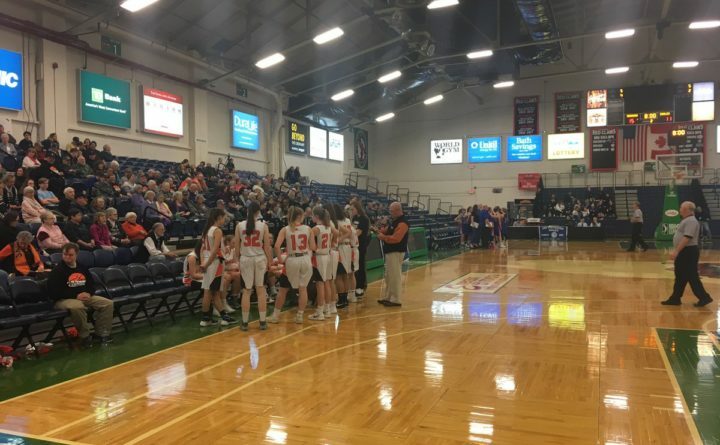 The second-seeded Dragons staked out a comfortable 35-15 halftime lead and finished with a 56-30 win at the Portland Exposition Building to advance to a semifinal round contest at 10 a.m. Wednesday against No. 3 Marshwood High School. MacMillan finished the game with 23 points, according to The Times Record. Teammate Alexis Guptil added 12 points, while Rosalie White had 10, according to Jeff Mannix of 95.5 FM, The Big Jab. Theresa Breed had nine points for Mt. Ararat. Brunswick defeated Mt. Ararat twice during the regular season, most recently topping the Eagles in Topsham on Feb. 7 by a score of 55-29. Brunswick continues its season with an 18-1 record, its only loss coming on Dec. 28 against undefeated and now top-seeded Greely High School of Cumberland. The Dragons and Rangers have faced off in the Class A South regional final for two straight seasons, with Brunswick taking the win in 2017 and Greely doing so last season. This was Mt. Ararat’s first tournament appearance since 2015, when the Eagles were knocked out in the preliminary round by Hampden Academy.